I am excited to announce two new clip art sets available this afternoon. They are intended to compliment each other and will work great for any of your feminine or baby design needs. Both sets feature hand drawn illustrations, vectorized and finished for use in your photo cards, stationery or party set design projects. They would also work great on your blog or website too. 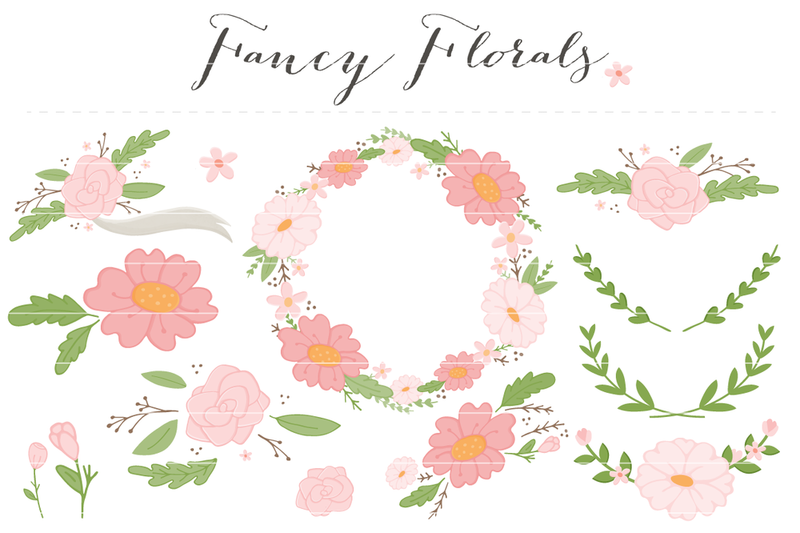 There is everything from cute washi tape and watercolor banners to lovely flowers. Purchase these designs on Creative Market or in my Etsy shop. Fall & Christmas Clip Art Coming Your Way! This week I finished up a few clip art sets that have literally been sitting on my computer for months! There are two new Christmas sets, Down Home Christmas and Holly Jolly along with one Fall Grateful Heart set. 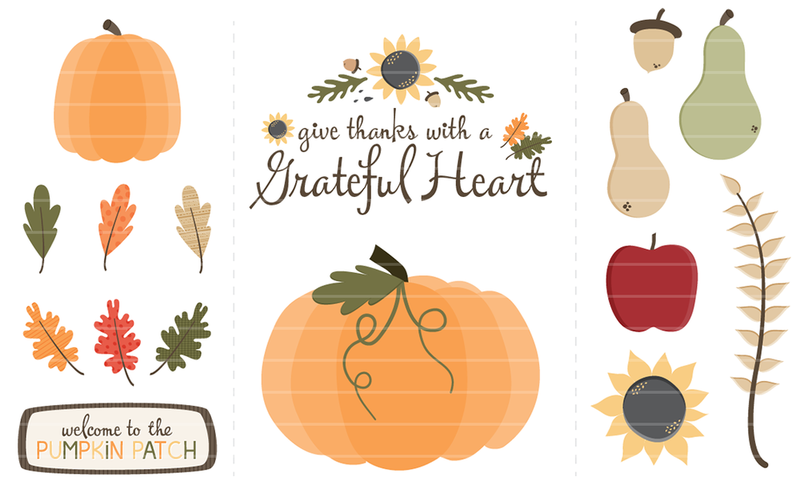 Each set is lovingly created from my hand drawn images, vectorized and colored. I pay special attention to all the little details to create a whimsical, set that you will find fun and unique and be able to use on YOUR projects! Find all of the sets in my Creative Market store, don't miss the intro pricing on Holly Jolly and Fall Grateful Heart sets, good until Monday! Miller's Signature Albums - Get the Scoop! Photographic paper AND Classic Felt press papers available in up to 100 sides. Standard Leather, Custom Image, Acrylic and Printed Metal covers with a one-piece design. Foil stamping available on Standard Leather covers. Amazing 2-3 day turnaround time. Free templates through Designer Plus Albums. Imagine your next high-end album with thick pages made from Classic Felt press paper, wrapped in a sleek, classy cover and delivered to you within 2-3 days. The Miller’s Signature Album is a simple choice that can’t be beat. It’s one ultimate album solution for every client. The Miller’s Signature Album will be available in the very near future! We are so excited that Millers is offering one of these new albums to the winner of our 10,000 Fan Giveaway! Head on over and enter today, the contest is ending soon! Don't forget to like Millers on Facebook. They are also a great source of inspiration on Pinterest too! Don't Miss Our Templates at Miller's Design Market! I am over the top excited to bring you my HUGE announcement weeks in the making! Photo Card Boutique is the newest designer added to the Miller's Design Market! Well what are you waiting for, click here and have a look! Every design sold at Millers is an exclusive design and will not be available here in our store or any other venues. Thank you to everyone for your loving comments, support and encouragement, my dreams are coming true! Custom design branding is a lot of fun but is it necessarily the only way to go? Let's take a moment to explore the advantages to buying a limited edition design and you can decide if it justifies spending hundreds, if not thousands of dollars on custom branding. Marketing Sets Make You Highly Visible Creating a memorable and lasting relationship among potential photography clients and their friends begins with branding your business. Limited edition marketing sets are some of the best money you can spend without a huge investment. You will have the ability to hand out professional, quality marketing pieces that ensure you are capturing the widest audience and reaching the full potential of your business. Limited Edition Designs are Professionally Designed Our limited edition marketing sets are designed just like a high dollar custom set. Your purchase is for professionally designed templates made in Adobe Illustrator and Photoshop. You are receiving high quality products designed with you, the professional photographer in mind. The end result is a beautiful product you will be proud to represent your business with. They are Super Affordable When Compared to Custom Work Custom marketing costs hundreds or even thousands of dollars. In an economy that is shaky at best that certainly isn't the wisest investment for your hard earned cash. Instead purchase an affordable design for less then $100 and still receive the same quality you would when investing hundreds or thousands in custom work. They are Limited Edition Spending less doesn't mean you are getting less! Every single limited edition branding set is ONLY sold to 10 people! Chances are your design will be exclusive to you for hundreds of miles around you. PLUS once you have added your own touches you wouldn't even be able to tell if they did! Limited edition at Photo Card Boutique is nearly as good as custom work but with the added cost saving benefits! 100% Customizable = 110% About You! Everything is customizable, right down to the background colors! You have full control of the finished look. Adding your existing logo or changing the colors to suite your business are just a few simple changes. The addition of your text and wonderful photos and you have a complete, professional marketing set unique to you! Perhaps you don't like the font, well switch it for the font of your choice. Literally the sky is the limit! Custom Work Takes Time... and you know the old saying time is money. Our limited edition sets are available for instant download after purchase. You can get to work making the design all about your business within minutes. Imagine spending a few minutes customizing each piece and sending it to print in the same day! You could begin promoting your business within the same week! Will Your Client Know Your Marketing is Custom? Finally, but ultimately the most important point I can make. Will your potential clients know if the piece you hand them was custom designed for you? More importantly will they even care? Is a custom marketing verse a limited edition marketing design going to make or break a sale? More than likely the answer is no! As long as you are handing over a beautifully designed piece that is thoughtfully laid out and presented in a professional manner your clients wont ever know the difference. Weigh the pros and cons for yourself and then take a moment to head on over and see our limited edition designs. You would be surprised at what a few changes can do to a template to make it look all about you!